Proust immortalised these French scallop-shaped fancies in his work Remembrance of Things Past. Make sure you grease and flour the tin heavily so they come out cleanly from the mould, then enjoy them just as the French do - dipped in tea! Store in an airtight container and eat them within two days. Preheat the oven to 190⁰C/375⁰F. 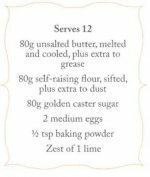 Generously grease a 12-mould Madeleine tin and dust it with flour. Whisk together the sugar and eggs in a bowl until thick and creamy. In a separate large bowl, combine the flour with the baking powder. Add half the butter to the sugar and eggs with half the flour mixture and fold in. 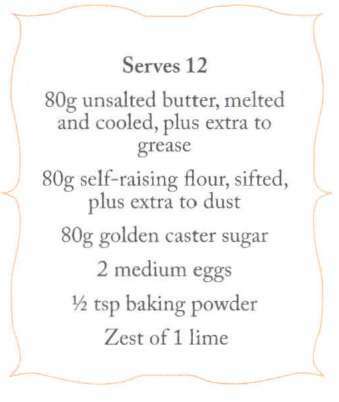 Add the remaining butter and flour mixture with the lime zest and fold everything together carefully. Divide the mixture among the moulds and bake for about 10 minutes until cooked and golden. Cool on a wire rack.